First comes moving. Then comes decorating. Cultivating your living space can be fun and relaxing. Doing it on a budget, however, can add in a whole lot of stress. Not only do you have to make sure that you can pay all your bills first, but your home improvement options face constraints from your wallet. For many of us, this means secondhand furniture and sparse statement pieces. However, with these ways to decorate an apartment on a budget, you can live like royalty—and without spending like it, too. Add a coat of paint to your furniture. Paint can instantly transform your furniture into something new. Light yellows and blues especially can make an apartment look cheerful and beautiful. If you’re a talented painter—or have a skilled friend who would love to help out—you can even paint designs onto your furniture. Just make sure you spread down a tarp and don’t get the floors or walls covered in paint! Create something handmade. 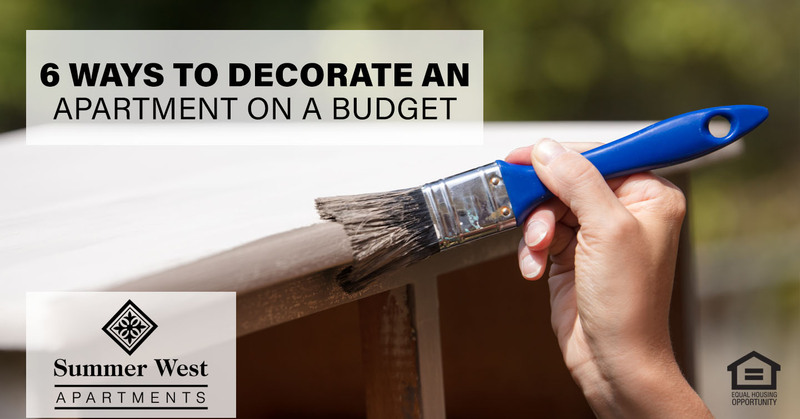 One of the ways to decorate an apartment on a budget is using your own natural talents. Whether you paint, embroider, or sew, you can make something handmade for your home. If you have a few creative friends, you can also do a homemade art swap. Pot a plant. By growing herbs on your windowsill, you can save money when you’re cooking. Rosemary, in particular, is a hardy plant with a variety of different culinary uses. If you’re worried about your gardening skills, you can always start with a small succulent. Decorate with decals. Worried about making holes in the wall? Choose decals instead! You can find ones bearing quotes, images, and designs—and they tend to be affordable. Plus, when it comes time to move out, they’ll come off the wall with ease. Shop the sale aisles. Many people like throw pillows, soft fluffy blankets, and gorgeous art pieces. However, these items are all pricey. When you go to your local retailers, check the sale aisles. You can find what you need at much more appropriate prices. Additionally, in the fall right after college students move in, you’re more likely to find great deals on leftover furniture and decorations. Finally, if you prefer to shop online, put the items you want in your online cart—then leave it alone. Some stores will offer you discounts as time goes by. Even if they don’t, you can monitor the price of an item until it becomes more reasonable. Hang up a mirror or two. Mirrors are masters of visual trickery. With them in your apartment, a little space looks enormous—and nicer. You can even find one used at a secondhand shop for cheap. Simply clean it up and look at it shine—good as new! Though putting together your new apartment can be dizzying, you have the tools you need to succeed. By trying out these great ways to decorate an apartment on a budget, you’ll soon have the most beautifully-organized unit in the building! Searching for an apartment to decorate? Call us at 601-264-6955 or visit our website here. For more apartment living tips, read our blog here. This entry was posted in Decorating on a budget, Summer West Apartment and tagged ways to decorate an apartment on a budget. Bookmark the permalink.